The Ordnance Survey triangulation point at the top of Crich Hill is 286 metres above sea level. The hill's commanding height above the Amber and Derwent Valleys, close to the site of Stone Age settlements which lie just to the North East, is reputed to have been the site of a beacon fire which signalled the sighting of the Spanish Armada in the English Channel in 1588 and where Drake's Victory was celebrated. During the reign of George III (1760-1820) a wooden structure 'with a platform' was built on the Hill. 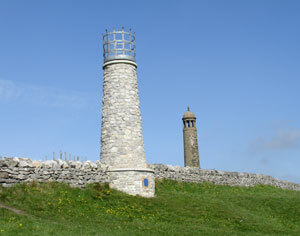 In 1785, Francis Hurt, whose family owned considerable landholdings in Crich Parish, rebuilt this structure in the form of a stone conical tower with a wooden platform on top from which he an his family could enjoy views across the Amber and Derwent Valleys as well as towards Nottingham and the Trent. By 1843 the tower was in ruins. In 1851 Hurt provided £210 to rebuild the tower. This took on the more familiar form of a round tower within which a spiral stairway provided access to a viewing platform and a plaque recording the height of the tower as 955 ft. above sea level. 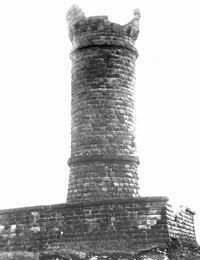 This tower was the site of celebrations to mark the end of the Crimean War (1854-56) when Sergeant Thomas Wetton of the 95th, Derbyshire Regiment, a resident of Crich who had lost a leg at the battle of Alma, was carried to The Stand in a specially adapted chair. This was reported in the Derby Mercury. Seemed forms of giant height." And often in tho woods its waters hides." And stand between our heroes and the grave." Persons on this occasion had the advantage of seeing objects through a powerful telescope, by the payment of one penny; it is said that the exact time could be seen on the illuminated dial of the Town-hall clock, Derby. The Sutton-in-Ashfield glee singers and brass band (distinguished as the Brick and Tile band) contributed greatly to the pleasure of the day, who executed several airs and glees with great taste. This band played an air on the top of the Stand, which was very effective. After the singers had given a glee, Dr. Spencer Hall (who was present) was requested to address the crowd. He spoke very feelingly of the extent and magnificence of the scenery around, and told them that a gentleman, a Pole, who accompanied him, and who had travelled through many countries in Europe, pronounced it unequalled by anything he had seen, except once, and that was a view in Switzerland. The Dr. spoke briefly but powerfully on the advantages of peace, and the glorious possibility of a universal brotherhood among the nations of the earth. Frequently during his speech, and especially at the conclusion, these sentiments were warmly applauded. The Derby drum and flfe band were indefatigable in their labours: they played polkas, waltzes, quadrilles, and country dances, which gave the lovers of dancing an opportunity of indulging in their favourite exercise. Several quadrille bands were in attendance at the different booths, where every refreshment could be obtained at a reasonable charge. About ten o'clock the large beacon was lit, and another fire in a very large tar copper. It may be said that the monster fire ended in smoke, for the dense black volumes of smoke driven by the wind from the tar copper almost prevented it being seen very far distant, especially southward. It would be observed best in an easterly direction, as the fire was made on the eastern side of the Cliff on account of the wind; reports having already been sent thai it was seen for very many miles in Nottinghamshire. The flames illuminated the features of the hundreds of people assembled on this lofty mountain. The bands continued to play, and the guns that had been fired at intervals during the day were now discharged in quick succession, rockets were sent from the Stand, and the scene altogether had an air of wildness and romance. At eleven o'clock the band played the National Anthem and then proceeded to the village, followed by the bulk of the people, who expressed themselves highly satisfied with the day's pleasure. It is impossible to say how many persons visited the Cliff on this occasion, but it is supposed that upwards of 4,000 were there at one time. The next chapter in the history of The Stand was disastrous and could have been terminal. Rendered unsafe by landslides and struck by lighting in 1908 access to The Stand was denied on safety grounds. 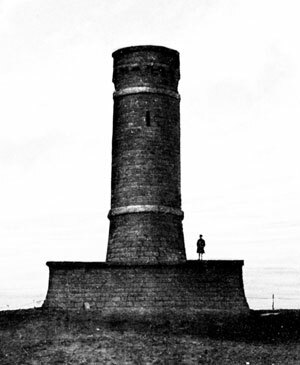 The land on which The Stand was built was sold with the condition that a new tower would be built on the site. So it was that the current Crich Stand was build, safely, further back from the cliff edge. It was built as a memorial to the Sherwood Foresters, a regiment in which many of Crich Parish served during both World Wars. Sherwood Foresters Memorial Tower was opened on the 6th. August 1923. It is still the site of an annual commemoration by the Sherwood Foresters. 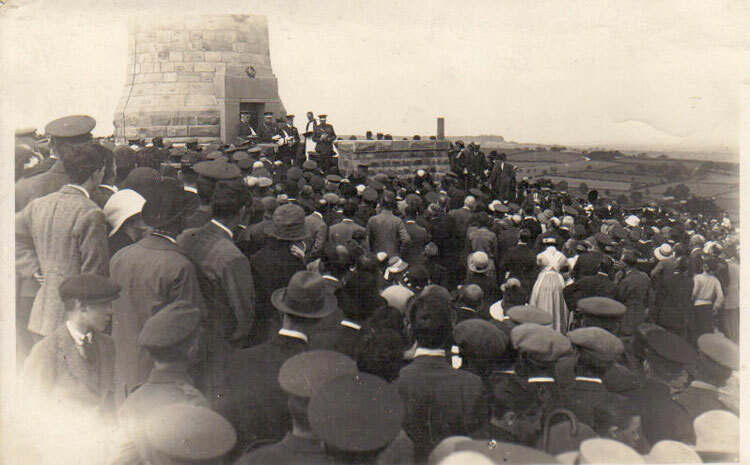 Crich Memorial Tower was opened on Moday 6th August 1923 at 4 p.m. by General Sir Horace L. Smith-Dorrien, Colonel of The Sherwood Foresters. In 1934 a 750,000 candlepower beacon was installed with a luminous range of 38 miles. However, in 1988 this had to be replaced by a much less powerful light for navigational reasons associated with the developing East Midlands Airport. 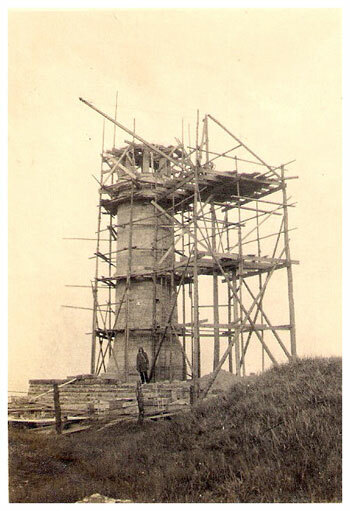 For the Queen’s Jubilee, Crich Parish Council with the collaboration of the Sherwood Foresters built a smaller beacon on the site which, fired by propane gas took part in the 'Fires over England' celebrations. The wheel had turned full circle. Crich Hill has a beacon again.